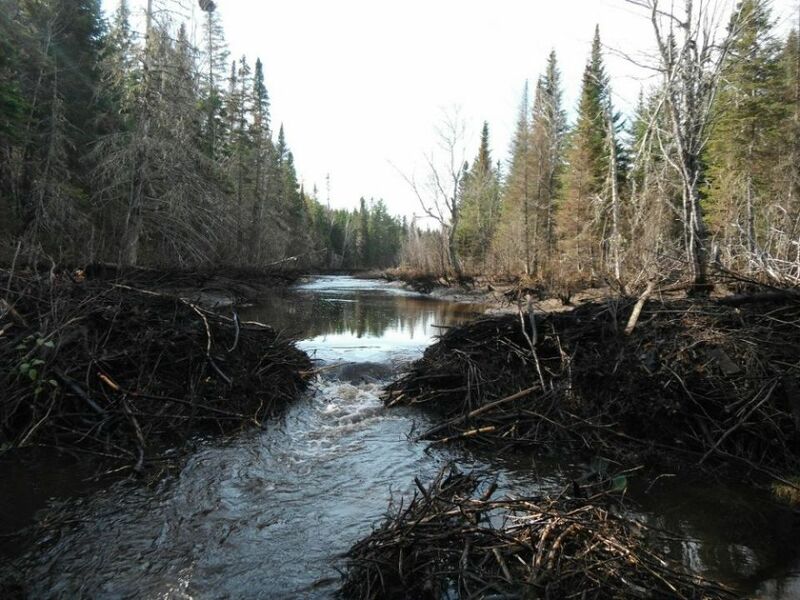 Each fall the Miramichi Salmon Association increases the spawning habitat available to adult salmon by removing beaver dams on tributary streams. 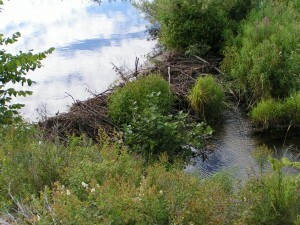 Beaver dams can impede the upstream progress of adult salmon and can prevent them from reaching headwater spawning areas, especially in years of low flow conditions. MSA staff canoe or hike into areas with known beaver dams and remove old dams or notch active beaver dams just prior to or during the spawning time for Atlantic salmon. Adult salmon which are held up below the dam can move upstream through the notch and the beaver later repairs the dam. We want to take this opportunity to thank all of the people who donated funds towards the beaver dam program. Beavers can block off access to spawning areas by building large dams or building dams in culverts or fish ladders. 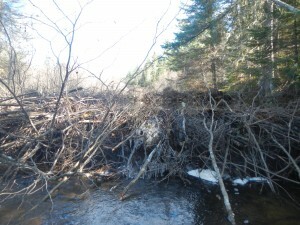 The effect of beaver dam blockages can be pronounced during a fall season with little rainfall and low flow, which do not afford Atlantic salmon enough water to jump over the dams. Salmon will congregate below the dams and if they cannot access the additional habitat in time, they will dig nests on top of each other which can kill the eggs in the underlying nests, thus reducing the number of juvenile salmon that will hatch the following year. Areas that fish cannot access for spawning become devoid of juveniles, do not contribute to the production of salmon on the river or provide food for wildlife (i.e. : eagles, otters). Beavers typically build dams on smaller streams which are excellent rearing areas for juvenile salmon due to the habitat quality, fewer numbers of large predators and cooler stream temperatures. Beaver numbers have likely increased due to the decrease in people trapping beaver, resulting in more beaver dams and more blockages for migrating fish. Most people trap to supplement their income with few people relying on it for their sole income. Over the past 5 years beaver pelt prices have been at the lowest point since the 1993/1994 season, and beaver harvests have declined over the past 7 years. Maintaining and increasing the number of adult Atlantic salmon that return to the river each year will ensure a strong and stable outfitting and guiding industry in New Brunswick, and provide the highest quality Atlantic salmon fishing experience in the province. One of the ways that we can do this is to increase juvenile salmon production by allowing adult fish access to spawning habitat above beaver dams. On Friday Sept 6, 2013 the Miramichi Salmon Conservation Centre was visited by Honourable Gail Shea, Minister of Fisheries and Oceans, and Tilly O’Neill Gordon, the MP for Miramichi. Mrs. Shea announced the Government of Canada contribution to support a 2 year salmon habitat restoration project entitled Improving Access to Critical Spawning Habitat for Wild Salmon Within the Miramichi River Watershed, funded under the Recreational Fisheries Conservation Partnerships Program (RFCPP). The government contributed ~ $51,000 over the 2 years (2013-2014) with MSA matching funding. The project includes the identification and opening up/breaching of in-stream spawning obstructions. From 2015 - 2017, a further $16,000 per year was provided by the RFCPP with MSA matching these funds. After identification (via aerial surveys) and mapping of the dams, crews begin breaching the dams in early - mid October. 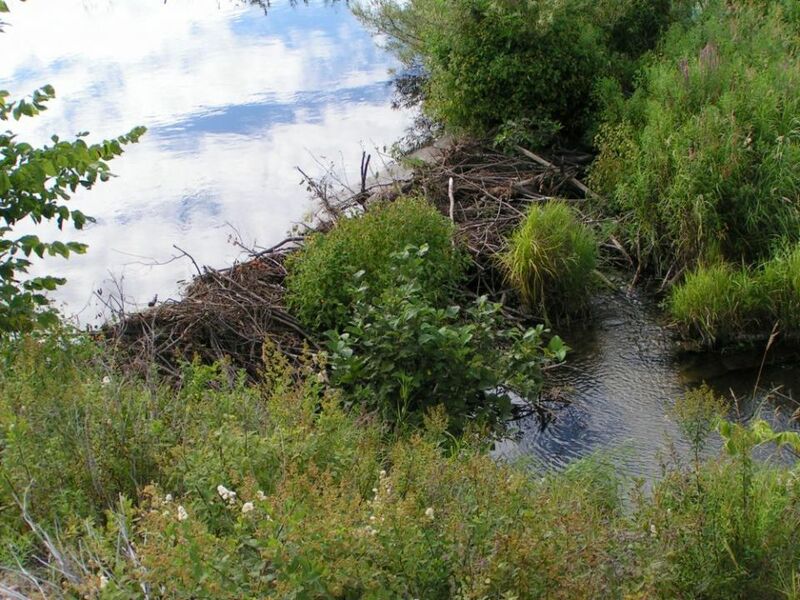 The MSA program for beaver dam removal is to create a hole in the dam to let salmon move upstream and the beavers usually have it repaired within 24 hours. We are not too concerned about the salmon moving downstream as they will wait in the beaver pond after spawning until a freshet tops the dam and they can move downstream. We are not targeting small brooks, only the ones that have traditional salmon populations like Porter Brook, Big Hole Brook, Betts Mill Brook, etc. From our past work, Porter Brook and Betts Mill Brook had virtually no juvenile salmon in the middle reaches of the brooks. By temporarily breaching the beaver dams over the past few years, we now have good populations of salmon and brook trout in these streams. Please see the links below for results from the last few years. In 2011, using donations from many MSA members and friends, we began a project focused on the lower section of the Cains River from Route 123 downstream. This section was chosen because the lower sections of the river are warmer in summer than the upper reaches, there are large tributaries with good habitat that are blocked by beavers, and the Cains has lower juvenile production than should be expected. Please click here to see the details of the Cains River project. Prior to 2006, few salmon fry were found on Betts Mills Brook despite the building of a new fish ladder near its mouth. 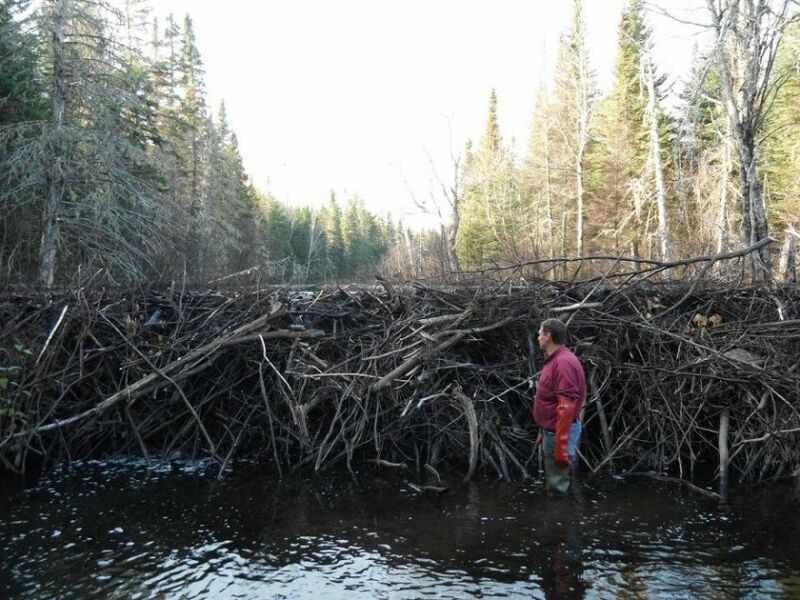 In 2006, the beaver dam blocking the fish ladder, as well as 21 additional beaver dams, were notched or removed on Betts Mills Brook resulting in access to more than 50,000m2 of spawning habitat and in fry being found in the brook the following year. Betts Mills Brook continued to be targeted by MSA staff each year with electrofishing survey results indicating few fry and parr in 2007 and 2008. However, in 2009 high densities of fry were captured in the brook, indicating that persistent efforts at removing the dams were successful. Betts Mills Brook is one of many brooks we continue to target every year.